Who were the Mound Builders? Definition: The 'Mound Builders' was the name given by early archaeologists to the ancient people who constructed elaborate earthworks from the Great Lakes to the Gulf Coast across the North American continent. The ancient Mississippian culture of the Mound Builders of North America were major elements in the Southeastern Ceremonial Complex of American prehistory (S.E.C.C.) The customs, rituals, traditions many famous mythical creatures derive from the beliefs of the Mound Builders. The Mound Builders associated great mystical value to the serpent. The Great Serpent represented a malevolent creature whereas the Horned Serpent and Feathered Serpent, were generally viewed as a benevolent, although fearful, creature. The Avanyu, a horned snake-like symbol both feature in Hopi and other Pueblo art. The origins of the mythology surrounding the Thunderbird, the Piasa Bird ("The bird that devours men") were also believed to have derived from the Mound Builders. The ancient Mississippian culture of the Mound Builders of North America were major elements in the Southeastern Ceremonial Complex of American prehistory (S.E.C.C.) The customs, rituals, traditions many famous mythical creatures derive from the beliefs of the Mound Builders. The Mound Builders associated great mystical value to the serpent. The Great Serpent represented a malevolent creature whereas the Horned Serpent and Feathered Serpent, were generally viewed as a benevolent, although fearful, creature. The Avanyu, a horned snake-like symbol both feature in Hopi and other Pueblo art. The origins of the mythology surrounding the Thunderbird, the Piasa Bird ("The bird that devours men") were also believed to have derived from the Mound Builders. The picture is of the Great Serpent Mound in Ohio, a gigantic serpent form made in earth. Across the widely opened jaws it measures 75 feet, the body measures 30 feet across and 5 feet high, the length of the Great Serpent is 1,348 foot (411 meters). The tail is thrown into a triple coil. The Mound Builders worshipped the sun and their religion centered around a temple served by shaven head priests, a shaman and the village chiefs. The Mound Builders had four different social classes called the Suns, the Nobles, the Honored Men and Honored Women and the lower class. The chiefs were called the 'Suns'. The 'Great Sun' ruled the people in all civil matters and the 'Tattooed Serpent' ruled the people in matters of war. The Great Sun and the Tattooed Serpent lived in the Grand Village or city. Lesser Suns from the royal family ruled smaller villages. Human sacrifice and ritual suicide formed a part of their culture. The wives and members of the entourage of the Great Sun and the Tattooed Serpent (up to 100 people) were expected to perform ritual suicide upon the death of a chief so that they might accompany him into the afterlife. 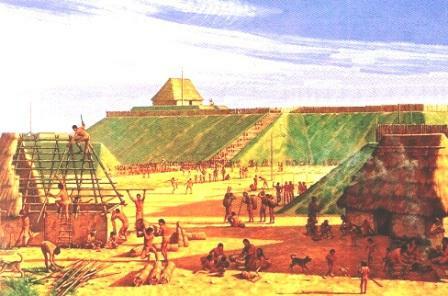 The Grand Village of the Mound Builders was organized around an open plaza with two, flat-topped mounds at either end. The smaller mound was the residence of the Great Sun, and the larger mound was the Sun Temple. The Sun Temple contained the perpetual fire and was approached by one flight of steps. The structures had no windows and only one door. The Sun Temple faced east towards the rising sun. Other houses in the Mound Builders village were built in a similar style, but were not constructed on the top of mounds.